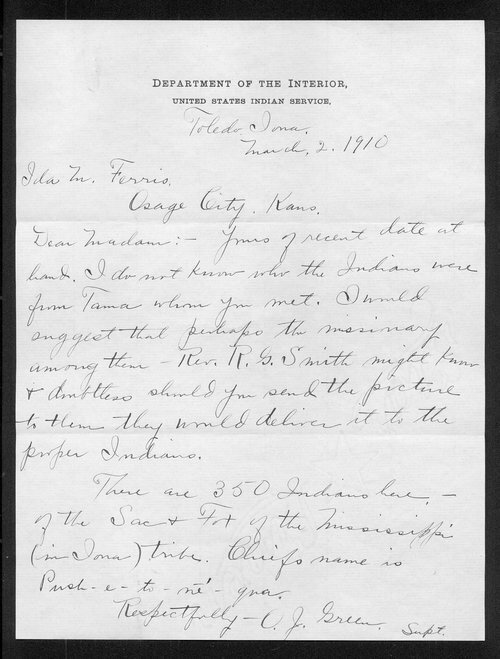 In this letter to Ida M. Ferris, U.S. Indian Services Superintendent O.J. Green answers Ferris's questions regarding Sac and Fox members in Iowa. Green explains that there were 350 Sac and Fox members in Iowa as of 1910, and that the leader of the band was Chief Push-e-to-me-qua. People - Notable Kansans - Ferris, Ida M.